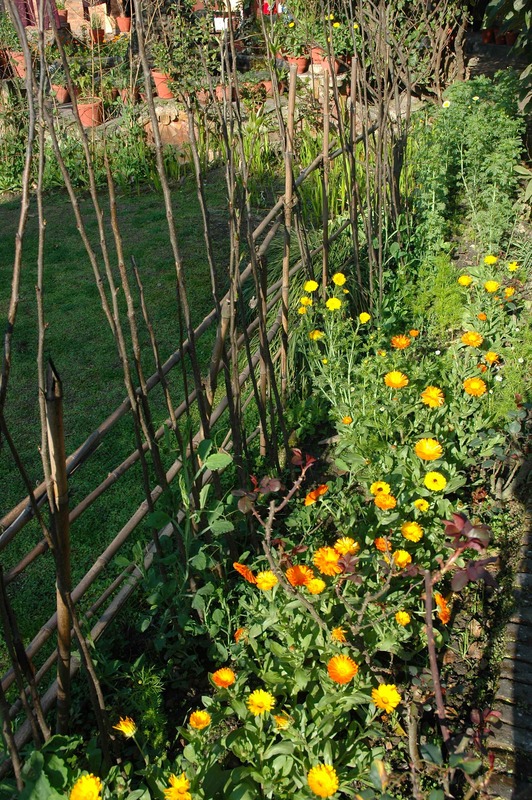 1) Sticks are the original trellis. 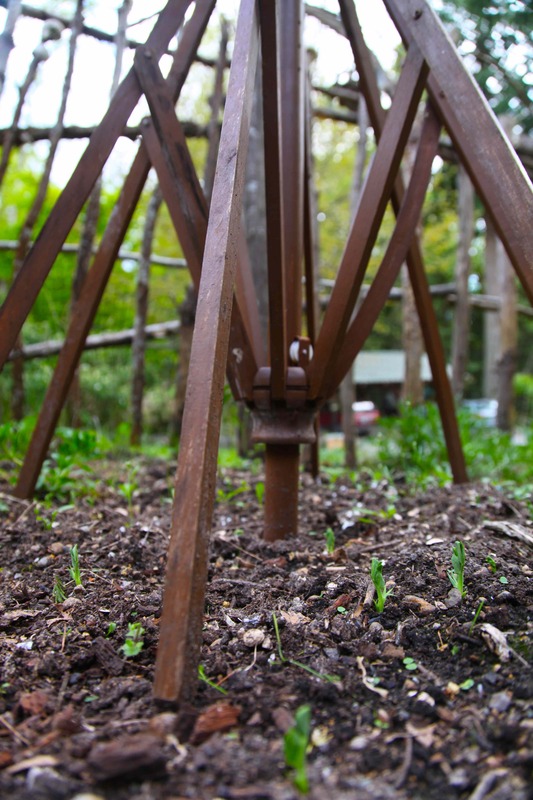 If you have sticks available, place them in a tripod-like structure, like a tipi, or if your sticks have many branches, just sink one stick into the ground with many branches for your peas or other veggies to climb upon. 3) Patio Umbrella Trellis: A broken patio umbrella can have a second life as a trellis. I have one in my garden now. 4) Bamboo and String Trellis: For your more delicate vines a bamboo frame for string is a beautiful trellis. 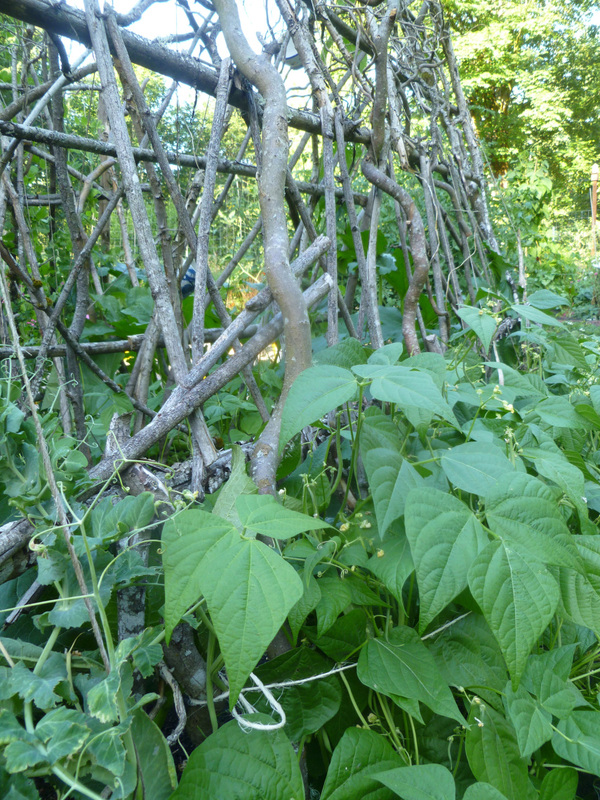 5) Tipi Trellis: With some long sticks, you can make a tipi trellis that serves to hold up your veggies and vines while providing a great green space for the kids. 6) Wagon Wheel Trellis: Wagon wheels make pretty trellises for climbing roses. 7) Old Window Frame with Chicken Wire: Use an old frame as a trellis with chicken wire attached. 8) Step Ladder Trellis: An old step ladder is an easy trellis to set up. 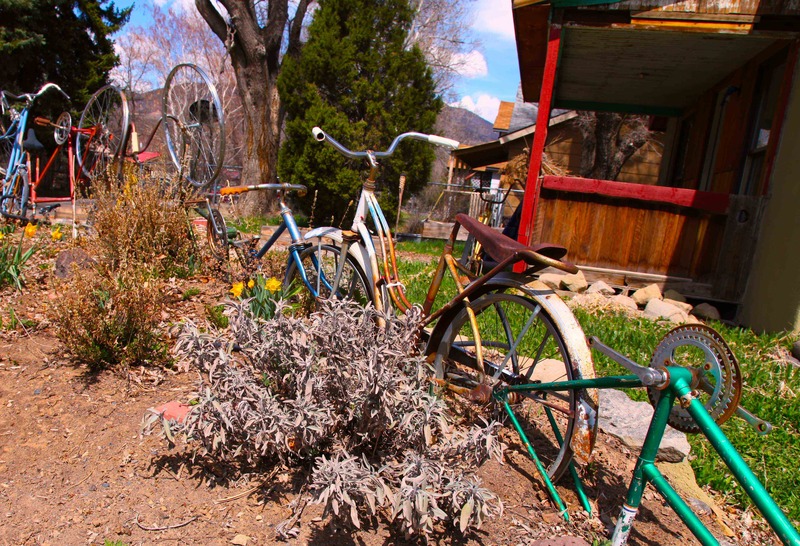 9) Bike Wheel Trellis: The photo here says it all. It’s a bike wheel totem trellis. 9) Wooden Coat Hanger Trellis: With an accordion-style wooden coat hanger, a few pencils and a paint stirrer, you’ll have a trellis. 10) Screen Door Trellis: Like the old window frame, an old screen door frame works beautifully as a trellis against your house. 11) Ski Trellis: Use skis to set up a trellis for your raspberries. 12) Bookshelf Trellis: An interesting book shelf partially buried in the dirt could make a nice trellis. 13) Sawhorse Trellis: A sawhorse or 2 can make an instant garden trellis. 14) Old Chair Trellis: Use an old wooden chair for a trellis. 15) Stretch of Picket Fence Trellis: If you have a length of picket fence, try using that as a trellis. 16) Rain Pipe Trellis: Our drain pipe on our house is serving as a trellis, and the clapboards, too. Some plants can climb anything. 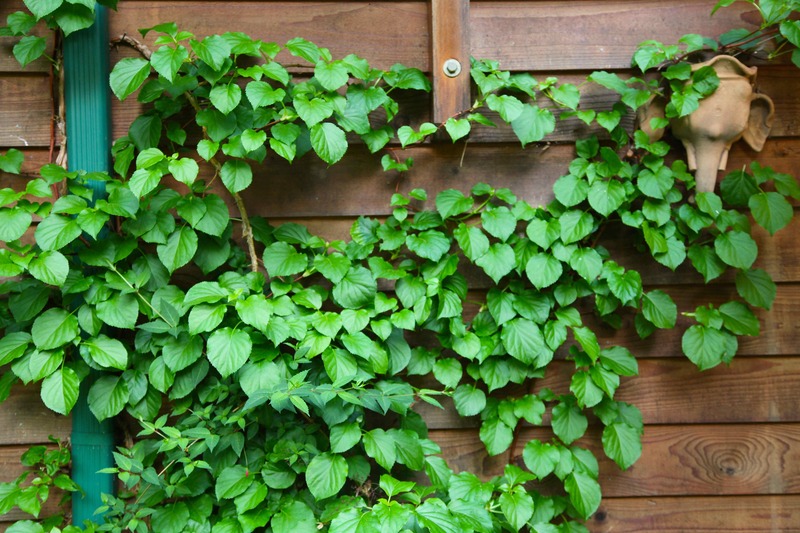 17) Fence Trellis: Just use a section of your fence to allow a flowering climber, like clematis, take over. 18) Chicken Wire Trellis: Don’t think I need to explain that one. 19) Ladder Trellis: An old ladder can hold up grape vines. You can add some bright paint to give it some pizazz. 20) Barbed Wire Trellis: If you’re handy like this Etsy artist, try making a barbed wire trellis. They’re beautiful. 20-25) Read our original post on DIY trellises for 5 more ideas including a headboard trellis, a baby crib trellis, and innovative stick trellises. 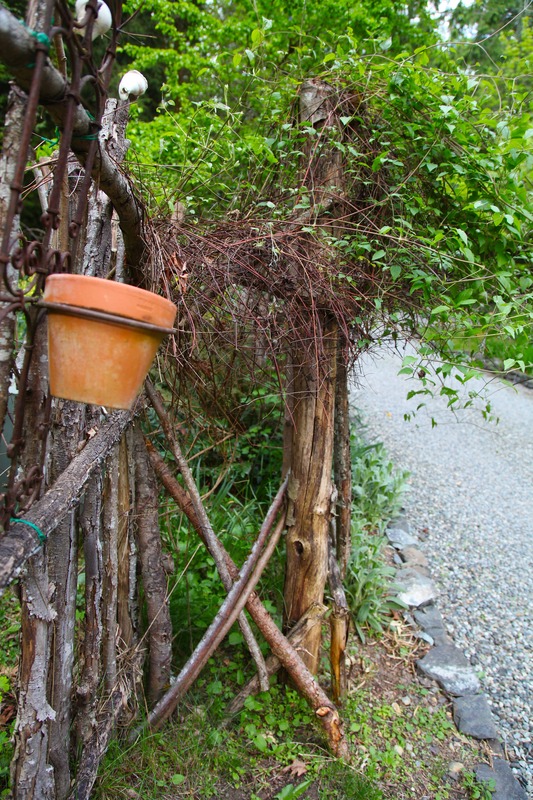 What do you use for a trellis? Ha! Well, plant a few peas around them and then they’ll look really cool!